Windows in mountain homes provide views of the breathtaking mountain environments we enjoy so much. So why do we need window treatments? During the daytime, mountain home windows are framed pieces of living artwork of spectacular views. But once the sun goes down, the windows becomes cold, black holes on the warm interior walls, creating an uncomfortable feeling. Even though the windows are usually facing directions where privacy is not an issue, your comfort at all times of the day is important. Window coverings provide warmth to interior spaces, provide continuity to exterior facades and of course privacy and security when needed. Plus, they can provide sun screening and UV protection to interior surfaces and materials from harsh sunlight. 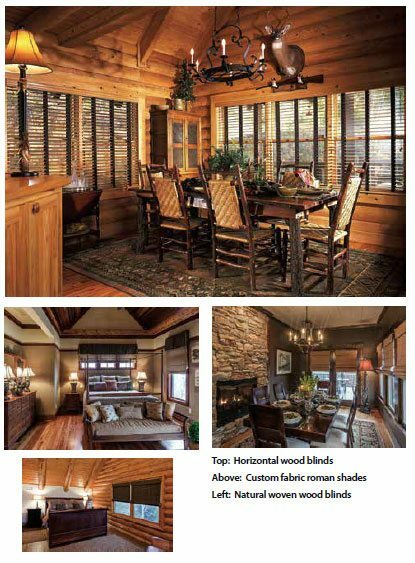 Depending on your needs, your budget and your design style, there are many types of window coverings available that are complimentary to all styles of mountain homes including: horizontal wood blinds, natural woven wood blinds, pleated fabric & roller shades, and custom made fabric treatments such as drape panels and valences. In recent years the natural woven wood blinds, pleated and roller shades have become very popular. They come in many colors and textures and have a lot of great features plus some great price points. When shades are used for security purposes only, homeowners desire the blinds to disappear as much as possible when not in use. Pleated and Roller shades have the least amount of exposure when they are retracted, leaving the window open because they gather tight against the top of the window frame. Natural woven blinds and horizontal wood blinds have valences that hang down 5 to 6 inches (needed to hide the mechanism) so they are part of the room décor whether open or closed. Many blind styles offer the top down bottom up feature so that the blinds can be lowered from the top so they still provide privacy on the bottom, but there is an open viewing area on the top of the window. Fabric Window Treatments are very popular, whether the home is rustic, traditional or modern. Fabric enhances and adds interest to so many aspects of the interior design. Fabric provides warmth both visually and physically and can help with acoustical issues. Many times we combine fabric with blinds creating a design statement, but providing functional window coverings.